Along with the fishing, we filled those few "off" days with exploring the town, special outings with each other, bus projects, Bible Bee study, music practice, exercise, and office work. Above, Taylor and Liz playing piano duets at a local cafe. Morning run with the sisters-to-be! A special bus lunch with these four one day when everyone else was gone. Mom listening to Elizabeth's BB verses. When we pulled into the RV park (where we stayed during our fishing time in Soldotna) we were super surprised to hear our music playing from a nearby lodge! Later, we found out it was these guys listening to our music. (pictured above with Josh) They worked along the river and had gotten our cd at a recent concert they had attended. They came over to tell us how our music was blessing them. Such an encouragement! Out on a hike---parents and the littles! We scheduled in a few days in Alaska (during the salmon run) for a little fishing! It wasn't a very good year for the salmon (so said the experts, and so we found!) but thankfully we were still able almost fill our several tags. Dad + the younger three guys were the main fishermen. (Josh had other things on the docket-as in, visiting fiancé! =)) Our dear fisherman friend from Delaware was there the same time we were (he was also with us four years ago-see this post here) and once again our guys were blessed by all his insider tips, locations, rental options, and "tricks of the trade"! Above, "fishing from the boat" selfie one day. Wet and cold, but still smiling! Rebs even got a chance to throw a line in! And then she reeled this one in. Whoops! You might have to look closely... is that bait, or a catch? 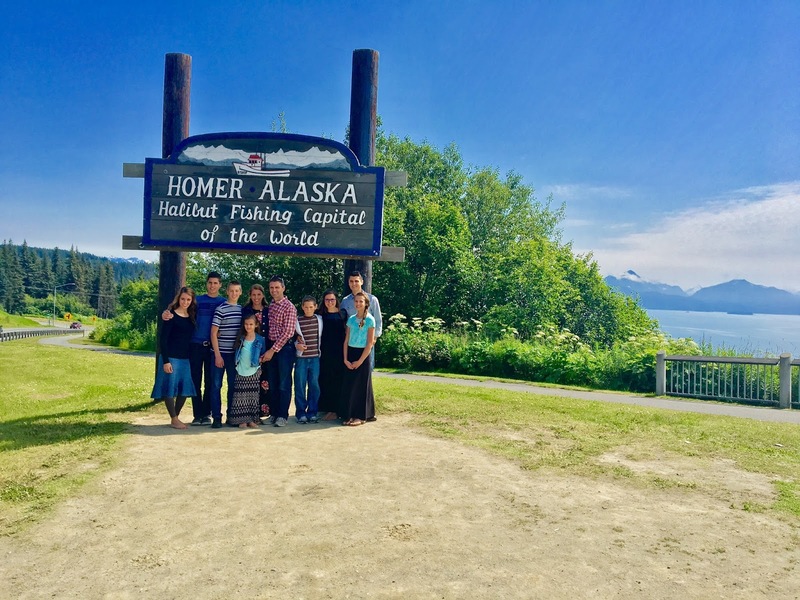 We spent our third Sunday in Alaska singing in the Alaskan towns of Homer + Soldotna. In between the two, we stopped along the highway at the overlook and got a few pictures again. 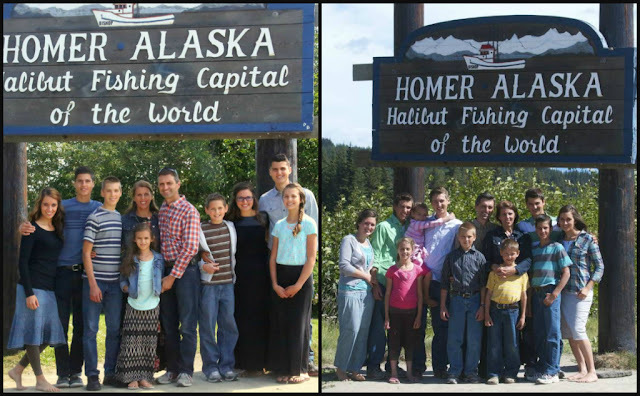 Come back for a special post tonight to see a little "then and now"
Sunday night concert in Soldotna! Keepin' it real with Elizabeth's yawn of epic proportions, and everyone else's ultra serious expressions. The energizer bunny boys! Love these two! 2017, on the left, and 2013, on the right! While in Soldotna, we got to again visit the fish camp of some dear friends (whom we met back in 2013) out along the ocean. We had a great evening around the campfire, and then a few of us got to get in on the fishing expedition of the following morning! Bus cleaning became an event. =) Denver had many interested onlookers! Pulling weeds with new friends. Comparing skills with chess and checkers. A huge thanks goes to our friends at Alaska Horse Adventures, for blessing us with this ride!